Accredited calibration of all types of pressure devices including pressure gauges, vacuum gauges, manometers, barometers and more. Our expert staff can calibrate gas/air and oil/water pressure gauges to UKAS standards. We pride ourselves on the experience of our technicians. Many have worked in offshore oil, gas, chemical and petrochemical industries. Our team of experienced professionals can accurately test and measure all types of gauges using our traceable hydraulic calibration equipment. When testing a gauge we conduct rising pressure tests and falling pressure tests. 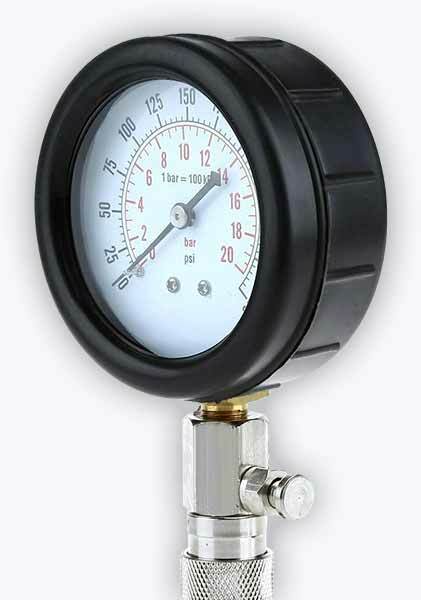 This checks that your gauge accurately measures increases as well as decreases in pressure. As well as calibration of pressure gauges, we also offer minor repairs and readjustments of zero errors and range errors. We can calibrate vacuum gauges up to -1bar. To do this we use a fully traceable pressure calibrator which can precisely pull a vacuum from zero to -1bar. We also calibrate pressure chart recorders. To do this we use our traceable hydraulic pressure equipment and our precise temperature calibration equipment. However, please remember when you send in your chart recorder for recalibration that you make sure to include the corresponding charts for your device. We calibrate these in exactly the same way as normal pressure gauges. However, our technicians also perform basic functionality checks on your device to make sure everything is working correctly. Since digital pressure gauges often have additional functions, these checks can help to spot common problems and steps can be taken to repair them. To accurately calibrate these devices our team of professionals apply a known pressure from a reliable, traceable source to national standards. The pressure is then increased in periodic steps across the full range of the instrument, ensuring that your meter is operating to its full capabilities. We can calibrate and set release valves to the customer’s required parameters. Please state the pressures to which you would like the valve to be set when you send in your instrument for calibration. If values are not stated we will calibrate the whole scale of the unit. We perform multiple tests when calibrating a Druck. The first set of tests are rising pressure tests; the purpose of these tests is to make sure that your Druck is maintaining pressure and that the pressure your Druck is outputting is stable and accurate. Secondly, we test all the electronic functions of your Druck. This includes voltage, current and resistance measurements. To discuss your on-site pressure calibration requirements please give us a call. To get in touch with us either fill in our quote request form or call us directly on 01642 626144.